Most people listen to music on their iPods with earbuds or headphones. But sometimes it’s nice to dock the iPod into a set of speakers. Could the Coby Vitruvian Speaker System be your next purchase? The Coby Vitruvian is made for iPod and iPhone, as well as other MP3 players. It’s compatible with iPods that go back as far as the 3rd generation, so it’s a safe bet that your iPod will work with the Vitruvian. I tested my iPhone 3GS, first generation iPod Touch, and 60GB iPod Video (now known as iPod Classic). Let’s start at the very beginning: inserting the battery into the remote. I’ve never had such a hard time opening a battery cover. The included manual never mentions a battery, so I checked on Coby’s web site for help. After five minutes of fiddling the battery was inserted and I was ready to rock and roll. On a side note, downloading the Vitruvian PDF instruction manual was very beneficial, not just for figuring out the battery problem. The above-mentioned manual is very basic; the PDF gives a little more information and explanation of the various buttons on the remote. Back to the speakers. I first tested the iPhone. Because I’m currently running iOS4, an error message popped up. Ignore it, I had no problems. I love music and listen constantly, but I admit I’m not an expert when it comes to sound quality. To my ears, the Vitruvian sounded great. Even my husband commented he liked the sound. Most of the time you’ll be using the remote to control your iPod. Browse through your music library, watch videos, fast forward or rewind, switch to Cover Flow, all with the remote. There are a few controls on the speakers, but it’s easier to use the remote, especially if you’re a few feet away. 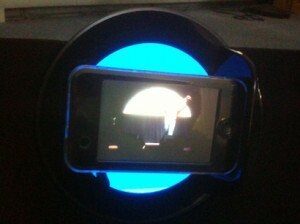 A click of the rotate button on the remote turns the iPod 90 degrees for video playback in landscape mode. 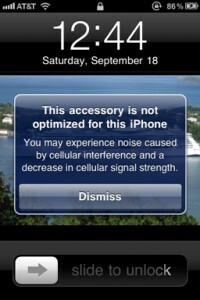 Cover Flow works in landscape mode with the iPod Touch, but not the iPhone. It’s possibly due to my running iOS4; however, since I’m not a Cover Flow fan, it’s a non-issue. Different iPods have slightly different behaviors when first docking into the Vitruvian. With the iPod Classic, the last song or video that was played automatically starts again, and the iPod screen goes directly to that video or song. However, the iPod Touch did things another way. If I last played a song, then the iPod Touch would open to that song. If a video was my last selection, the Touch opens to the video page, not the video itself, while playing a song. Not sure why that happens; all I know is that it’s not a positive feature. Finally, with the iPhone, no matter what I listened to last, music starts to play while still showing the home screen. Once I click the iPod button I can then start controlling the music and videos with the remote. These may be only minor annoyances to some people; for me, I’d rather decide for myself what I want to listen to or watch. The Coby Vitruvian can also be used as computer speakers by attaching a 3.5mm auxiliary cable from the computer to the back of the Vitruvian. The remote can still be used to control the volume. There’s no carrying handle. The Vitruvian is a decent size, and needs to be carried either with two hands or underneath the arm. A carrying handle would be much more convenient. No battery compartment. The Vitruvian runs only on AC power. That rules out bringing it to the beach, camping, picnic—anywhere there isn’t an electrical outlet. Overall, I do like the Coby Vitruvian. The sound quality is good, it’s compatible with virtually every iPod currently available, it charges the iPod/iPhone while you listen to music, and the remote is handy for changing songs and adjusting volume. Plus, the ambient lighting behind the dock is a nice touch. If Coby adds a carrying handle and a battery compartment you may be seeing the Vitruvian at your next picnic or beach party. Thanks for this simple, yet concise review. 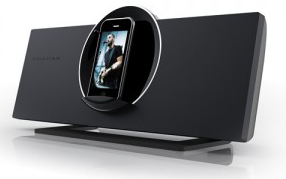 I have been considering purchasing this dock for a couple of weeks. You have made my decision easier. Sounds like a good deal for the money. You’re welcome, Rohan! Glad we could help! Will this work with an iPod Nano? Yes Glen. Compatible models listed on the box are iPhone, iPod, iPod Mini, iPod Touch, iPod Classic and iPod Nano.